yeah i like it, you did a good job copy pasting a picture. What's the problem man. If you dont like don't doenload it. This not just a picture. Meh... I'm an Alienware hater, but still, I like it.. sorta... ish. It just has an... I dunno, a shinyness to it that I like. Looks good from the picture. don't ask if you don't wanna know, and if it's not just a picture, what did you do to it? go on the alienware website and you'll find out that there is no picture like this one. See, what I think is that many people prefer to have a real computer on their desktop instead some painted one. It looks much cooler. This Icon is designed to go on when your mouse goes over it. If you are not sadisfide with that I am going to upload a new Icon on the DektopX section. Check it out. Its gona include a sphere. then copy paste 3 times? You actually went and did a reseach on it. Men get life, or a girlfriend. Actually I have both, besides it only took 5 minutes to find all 3 pics you copied. I don't have an alienware computer but I did give this icon a closer look because it looked kinda neat. 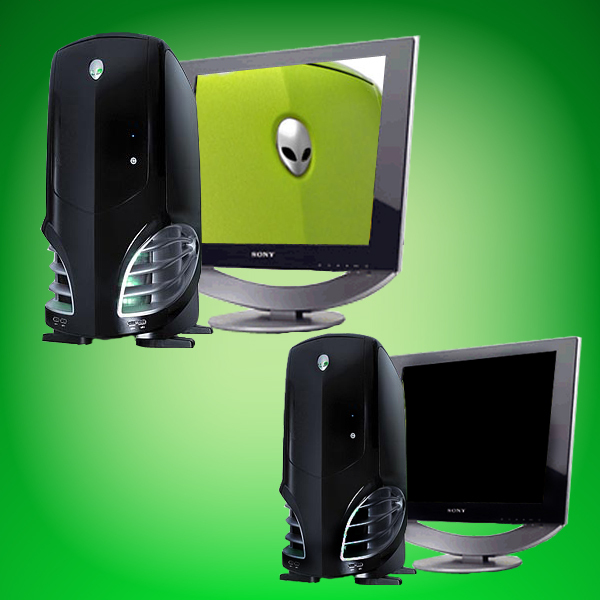 If I used alienware, I would download it. 1. I really like it. 2. It's free to use. 3. I didn't have to make it. 4. It's fun to use different icons created by unique individuals. I have an Alienware chassis (although it's P2) & I have that monitor so thank you.